The Antiquities Coalition today released a policy brief analyzing how Hong Kong’s laws and regulations can be improved to prevent trafficking of art and antiquities. China’s burgeoning economy and newly wealthy class is leading to a growing commercial demand for one of history’s oldest status symbols: art. Hong Kong, already a leading seller of modern masterpieces and ancient treasures, as well as a convenient and much used transit hub for cultural goods, is meeting this need. “Unfortunately, insatiable demand drives both the strong legitimate market for Asian antiquities and a robust illicit market,” says Steven Gallagher, Associate Professor of Practice in Law and Associate Dean of Academic Affairs of the Faculty of Law at the Chinese University of Hong Kong. “Where there is demand and lack of supply, opportunities arise for those willing to turn a blind eye.” This thriving business comes at great cost both to the city’s reputation as a legitimate marketplace, and to Asia’s cultural heritage, which is increasingly falling victim to looting, theft, and trafficking. 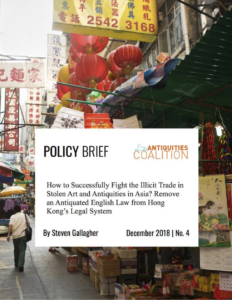 In the Antiquities Coalition policy brief, Gallagher explains some of the problems Asia faces with regard to looting of art and antiquities, and how Hong Kong’s legal and regulatory framework does little to prevent the jurisdiction from being used as a market and transit state for trafficked cultural patrimony. Renowned as one of the world’s leading financial and commercial centers, Hong Kong is trusted because of rigorous regulation of its efficient financial and banking services, and confidence in its common law system. Its Asian art and antiquities market is equally celebrated. However, in a perplexing break from this otherwise estimable reputation, Hong Kong’s retention of a single medieval-era English law—often described as a “thieves’ charter”—has allowed a thriving illicit art and antiquities market to grow within its borders. Find a summary and link to the complete policy brief, “How to Successfully Fight the Illicit Trade in Stolen Art and Antiquities in Asia? Remove an Antiquated English Law from Hong Kong’s Legal System,” here. The Antiquities Coalition unites a diverse group of experts in the international campaign against cultural racketeering, the illicit trade in art and antiquities. This plunder for profit funds crime, armed conflict, and violent extremist organizations around the world. By championing better law and policy, fostering diplomatic cooperation, and advancing proven solutions with public and private partners worldwide, the Antiquities Coalition empowers communities and countries in crisis to safeguard cultural heritage for future generations. Launched in 2016, the Antiquities Coalition Think Tank joins forces with international experts, including leaders in the fields of preservation, business, law, security, and technology, to bring high-quality, results-oriented research to the world’s decision-makers, especially those in the government and private sectors. Policy briefs strive to strengthen policy-makers’ understanding of the challenges facing collective human heritage, and to help them develop better solutions to protect it.